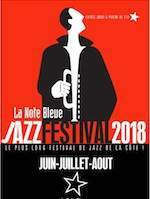 In the jazz lounge, two performances, on 29 and 30 August, by French electronic band, Nojazz. NoJazz was formed in 2001 and released its first album in 2002. They are beat maker Philippe Balatier on keyboards, Pascal Reva on drums, Jeffrey on vocals, Philippe Sellam on sax, and Sylvain Gontard on trumpet.